Could there be a more delicious time of year than autumn? 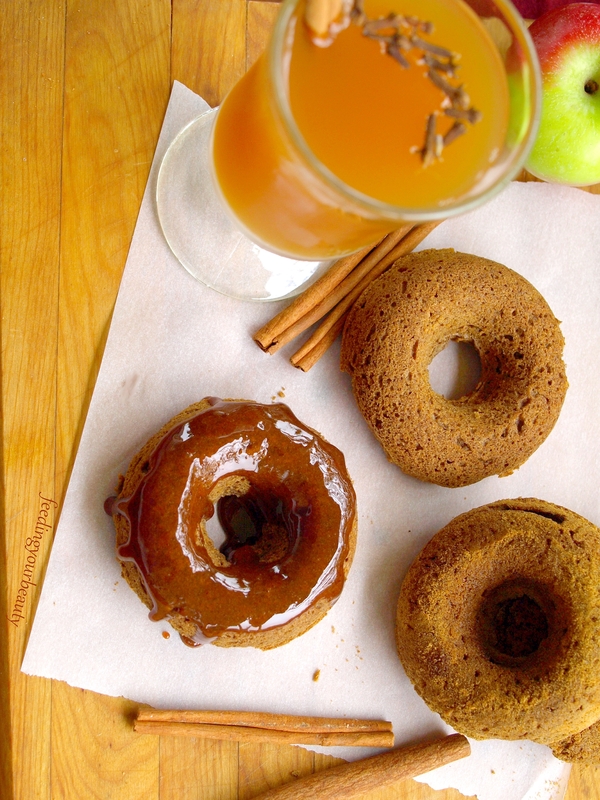 I mean seriously… cinnamon, nutmeg, ginger, apples, pumpkin, squash… baked goods… hot mulled cider. Goodness me! I know I say this about every season, but there is just something special about fall and all of its associated goodies. There’s a hypnotizing coziness about it that makes me want to bake all day and then envelop myself in a thick fuzzy blanket, clutching a warm mug of calming pumpkin chai steamed milk, and just sit and breathe in the cinnamon and nutmeg vapors. 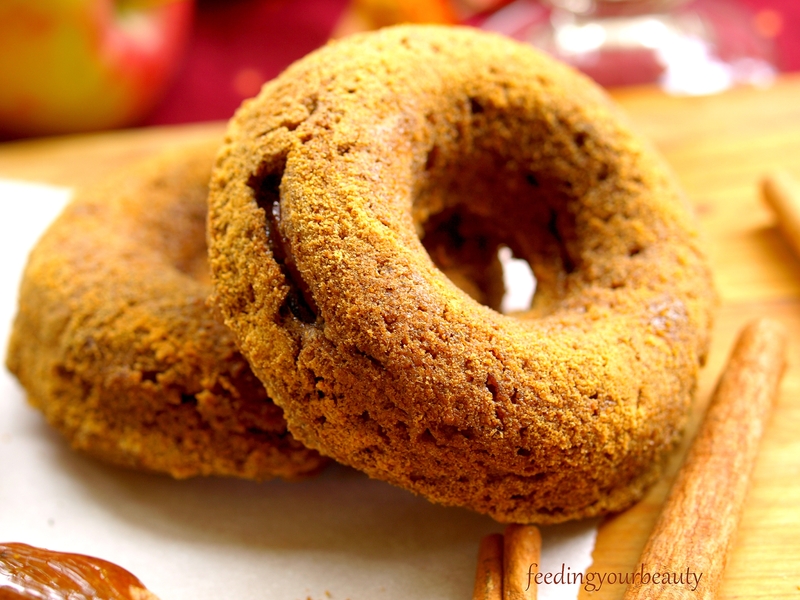 I’m on a serious autumn high and these aromatic donuts are only feeding into it. These donuts were a serious labor of love. I started out with some pretty lofty goals. I wanted to come up with a healthy donut recipe (yes, I just said “healthy” and “donut” in the same sentence) that not only tasted amazing but was also gluten-free, made with simple and affordable ingredients, no oil, and no concentrated sweeteners (sugar, syrup, etc). Boy oh boy oh boy. I didn’t know what I was getting myself into! I thought I had nailed it on my third batch (I was only making 3 at a time), they were soft, fluffy, and reminded me of something I used to get once a year when our family would visit a local cider mill. Unfortunately I may have been delusional because when my husband tried it he made that “uh oh I have to tell her I don’t like it” face, where I can tell he’s scrambling to come up with something nice to say. Haha. So it was back to the drawing board. About 2,342 batches later, trying all kinds of combinations, oven temperatures, and methods, and testing them on my family for a week, I finally hit the jackpot. These are soft and moist, without being too dense, and bursting with spices and apple flavor. 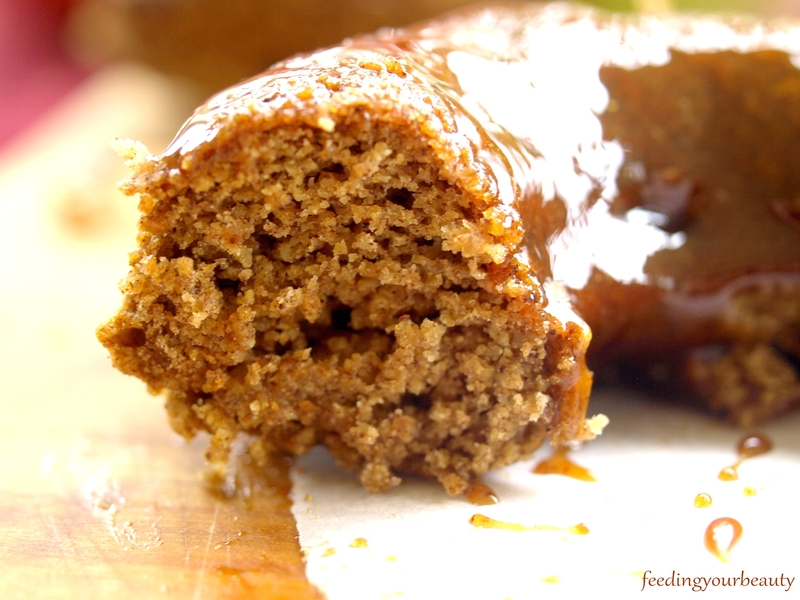 All while being gluten-free, refined sugar-free, vegan and using easy to find ingredients. They are oil-free, and sweetened with a few dates, applesauce, and a touch of maple syrup (which is optional). 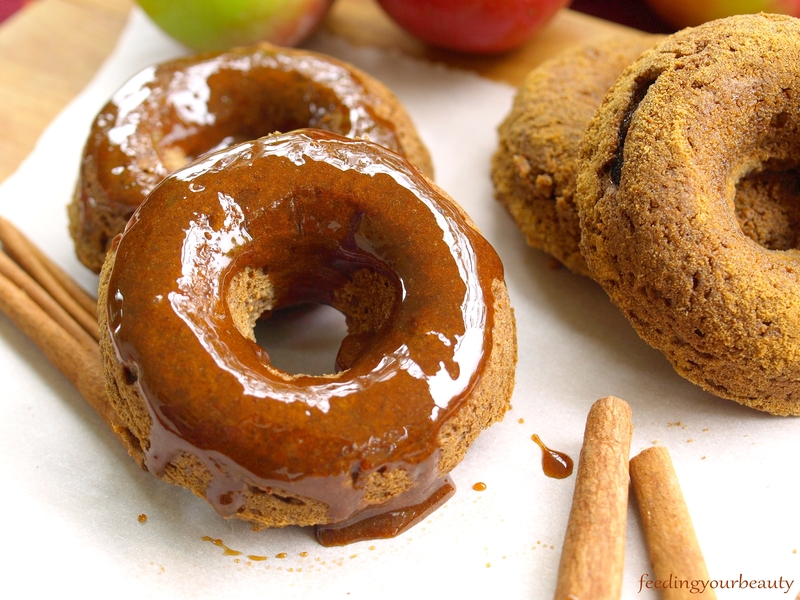 These are mind-blowing with the easy apple cider glaze, or you can opt to coat them in homemade powdered coconut sugar. Both ways are lip smackin’ good. Since I believe that you can’t have too much of a good thing, I also warmed up some apple cider to sip along with them. So delicious. For a fun twist, try coring and slicing an apple and baking it into the donut. 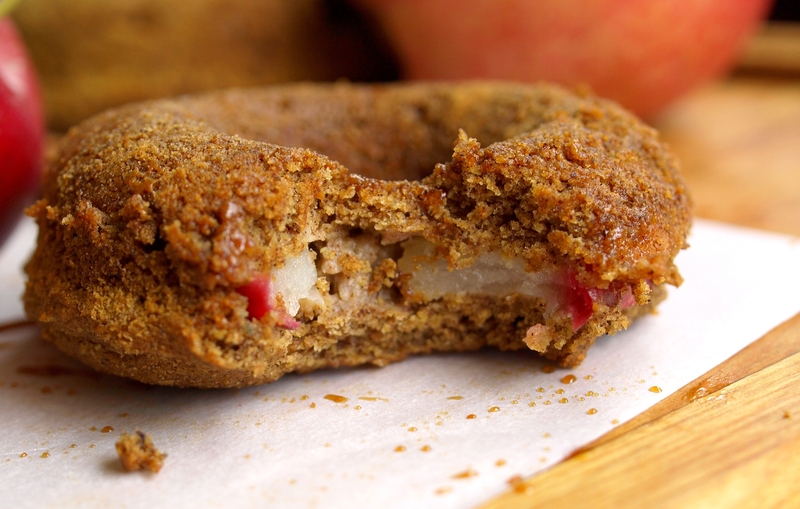 It ups the sweet factor without adding any sweetener and adds a fun apple “filling” to your donuts. Ready to immerse yourself into fall? Grab your donut pan and prepare your fuzzy blanket. 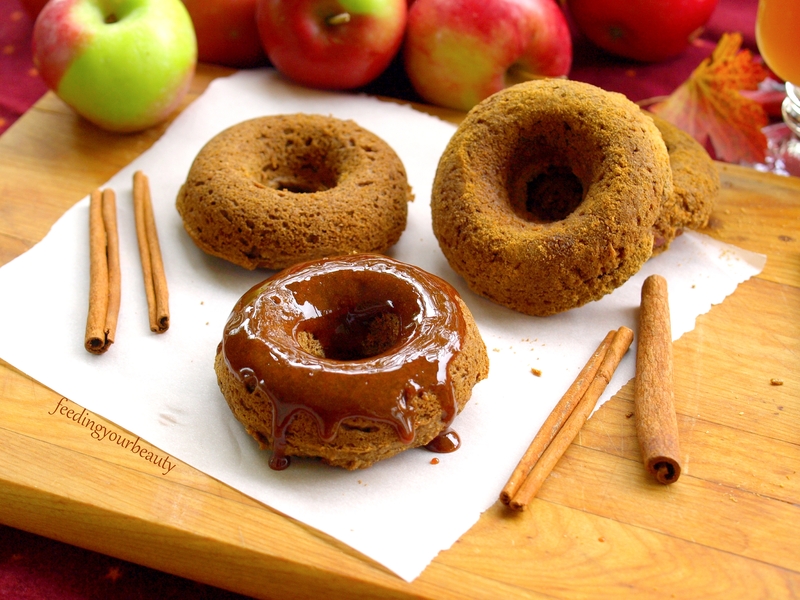 You’ll be happily breathing in the warm, intoxicating aroma of apple spiced donuts in no time. Ahhhhhhh. Preheat oven to 325 degrees F. Grease a donut pan with coconut oil or avocado oil. Mix the dry ingredients in a large bowl with a whisk, mix very well and break up any clumps. Add all the wet ingredients to your blender and blend on high until smooth. Pour into the dry ingredients and mix with a wooden spoon. Add an extra tablespoon of almond milk if the batter seems to dry. It should be thick, moist and sticky, with no dry clumps. Fill the donut pan 2/3 to 3/4 full, smoothing the tops. Remember they will rise. I kept a bowl of warm water to dip my fingers into to keep the batter from sticking to my hands as I smoothed it. Bake at 325 for about 18 minutes, checking after 15. They will be firm to the touch and lightly golden. Let them rest in the pan for a good 10 -15 minutes before removing from the pan and cooling completely. I think they taste the best after another hour or so, and you can always reheat them a little bit. For the glaze, simply bring the apple cider and spices to a low boil in a small pot. Continue to simmer for about 20 – 30 minutes until the cider has reduced by more than half. Let it cool. Add a tablespoon or two of powdered sugar to the reduced cider for a more traditional glaze, if desired. It will thicken as it cools. 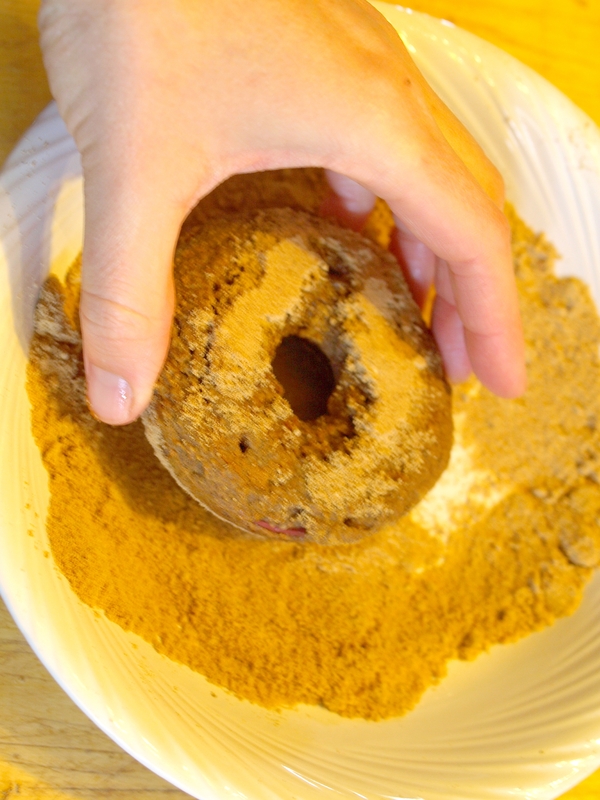 Alternatively, you can roll the donuts in the powdered coconut sugar and add an extra sprinkle of cinnamon. Yum! Best eaten within a day or so. To bake an apple ring into each donut, simply core and slice a small apple in 1/4 inch slices. Make the batter as described above and then fill each cavity in the donut pan only a quarter of the way, top each with an apple slice and then fill the rest of the way with batter. Continue with the rest of the recipe. These look so good! & just perfect for fall! Yum! Btw: Do you happen to have the nutritional information on these? Thank you! Hi there! I have not calculated it yet but I will do that and add it to the post! I will let you know when I do! I’ve thought of including nutrition facts but so far haven’t been asked so thank you for asking! Wow thank you so much, that is such a big compliment! 🙂 I hope you love it! Def let me know if you give them a try!